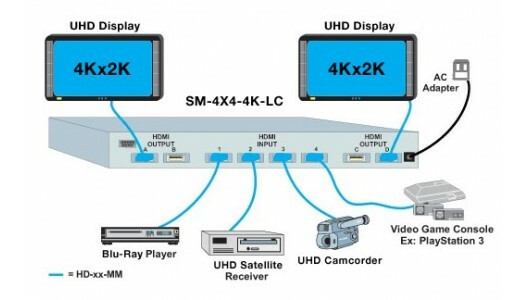 The 4K HDMI Matrix Switch routes 4Kx2K video and digital audio from four HDMI sources to four Ultra-HD displays. The switch can be controlled via the front panel buttons, IR remote control or RS232 commands. Supports Ultra-HD 4Kx2K resolutions to 3840x2160 (30Hz), 2K resolution 2048x1080, and HDTV resolutions to 1080p.